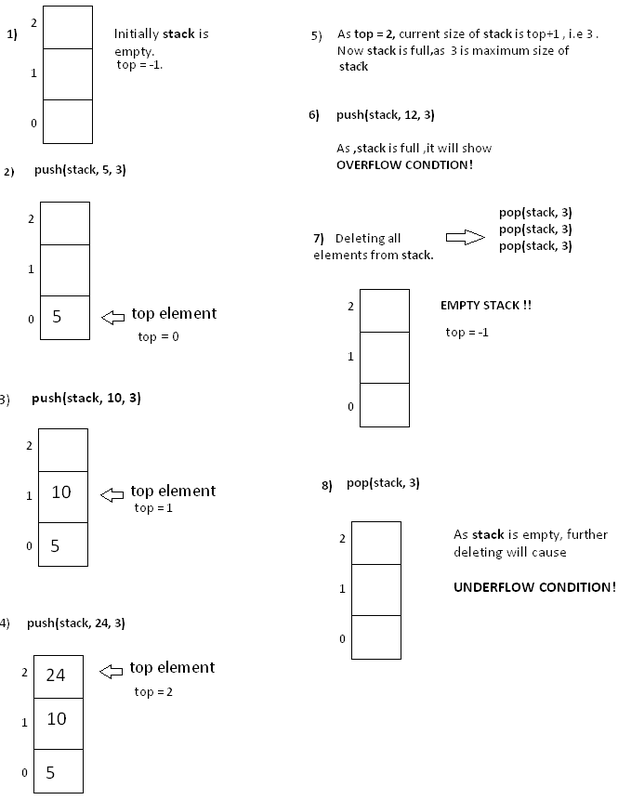 Stacks have restrictions on the insertion and deletion of elements. Elements can be inserted or deleted only from one end of the stack i.e. from the $$top$$. The element at the top is called the $$top$$ element. The operations of inserting and deleting elements are called $$push()$$ and $$pop()$$ respectively. Size of stack changes with each $$push()$$ and $$pop()$$ operation. Each $$push()$$ and $$pop()$$ operation increases and decreases the size of the stack by $$1$$, respectively. 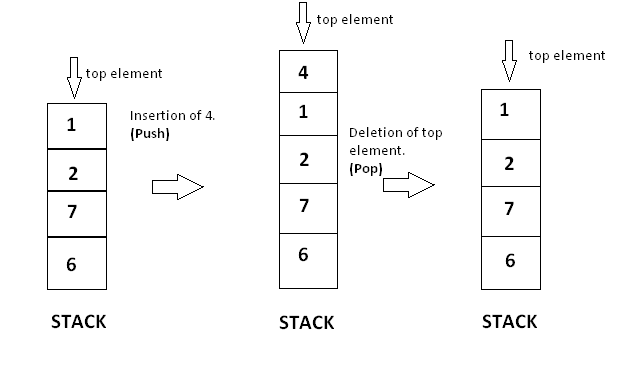 if ( top == n-1 )       //If the top position is the last of position of the stack, this means that the stack is full. // pushing element 5 in the stack . //As the stack is full, further pushing will show an overflow condition. //As the stack is empty , further popping will show an underflow condition. Refer to the following image for more information about the operations performed in the code. Consider the balanced parentheses problem. You have a bracket sequence made up of opening '(' and closing ')' parentheses. You must check if this bracket sequence is balanced. A bracket sequence is considered balanced if for every prefix of the sequence, the number of opening brackets is greater than or equal to the number of closing brackets, and the total number of opening brackets is equal to the number of closing brackets. You can check this using stack. Let's see how. You can maintain a stack where you store a parenthesis. Whenever, you come across an opening parenthesis, $$push$$ it in the stack. However, whenever you come across a closing parenthesis, $$pop$$ a parenthesis from the stack.